last out of water in 2017 for checking and last anti fouling in 2015 by Hire company. hatch over the bed, side windows. saloon with 3 accesses, starboard next to the helm, one directly onto the foredeck and its outside table area. One huge sliding door to the aft deck and sun bathing area. The last access to outside is through the stern cabin door onto the swim platform. Saloon with galley space on starboard side, domestic fridge and freezer compartiment, a 4 gaz burner cooker and a gaz oven. NICOLS 1350 CONFORT for sale in France. 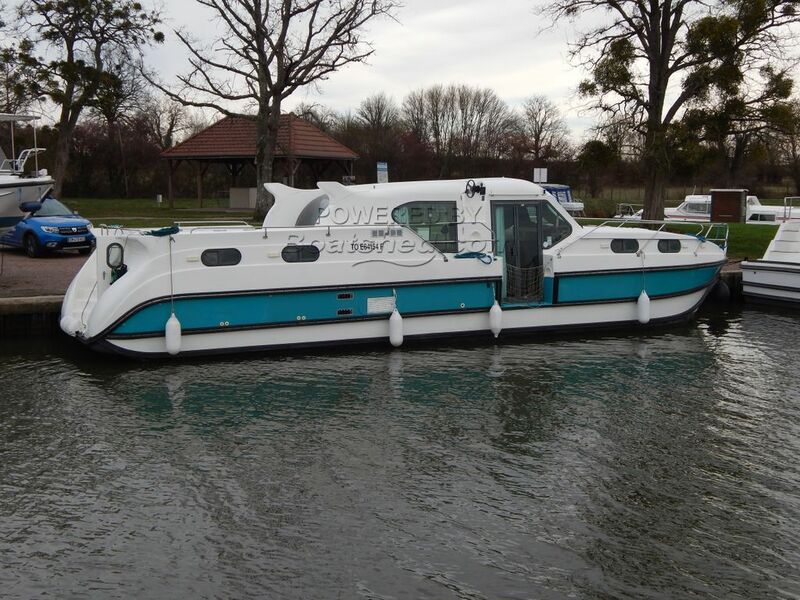 Boatshed Bourgogne is pleased to offer this Inland waterways cruiser for sale, ex hire boat, in private hands since 2016 and professionally modified & maintained since. Our curent vendors have had the forward double cabins professionally converted into a master cabin but have kept the 2 separated heads and showers. I think that was a stroke of genius so there's always a head or shower available when one is occupied! The saloon has acquired a cozy look yet kept the huge panoramic windows and glass doors to afford light and a feeling of space to the whole area. Finally moving aft are the two identical guest cabins each with shower & heads and able to be set up with twin beds or a huge double. Lots of outside deck space. Aft deck with access to & from the bathing platform, and steering position on the flybridge. Foredeck accessed from the saloon door, and equipped with a table (currently stored) . Our owners have improved the boat to their requirements, including the creation of the forward owners cabin, installing proper marine reverse cycle air conditioning, adding a new 5Kva generator in a cocoon (all works carried out in 2016. Nicols boats may be considered a bit "quirky" but I think their novel designs really work and this is a practical & comfortable boat with three cabins & three separate outdoor deck areas to have fun, sunbath or sneak off to a quiet corner & enjoy a book! An awful lot of inland waterway cruiser for just 13.5m. For more information or organise a viewing, please contact Graham, your local broker at Boatshed Bourgogne. This Nicols Confort 1350 Modified Three Cabin Layout has been personally photographed and viewed by Graham Wharmby of Boatshed Bourgogne. Click here for contact details. Please note this comments section is public. Please do not post your personal details here. To enquire about purchasing this boat, please contact the broker directly at boats@boatshedbourgogne.com. Please read our commenting guidelines before posting.